It’s nearly Christmas! The children are performing a nativity play with sparkly wings and animal masks . . . But what can they do when there is no room to perform their play? Perhaps Barney’s Dad, a farmer, can help? 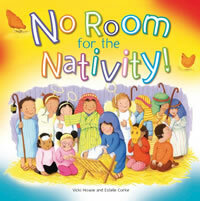 This mini-book would make an ideal gift for children in a Sunday Club or playgroup performing a nativity play. 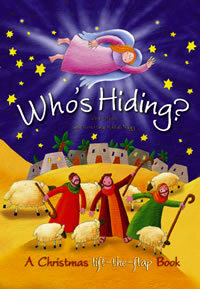 The book might help the children to understand the nativity story and remind them of their actions and mimes in the play! Someone’s hiding behind the door. Who it is we can’t be sure. What Christmas time is all about! The answer lies on a bed of hay. An angel will help you on your way! What a surprise! Here’s the angel Gabriel with a message for someone. Who could that be? Open the doors in the nativity story to discover Mary, the soldier with news of the census, the innkeeper, the angel who appeared to the shepherds, a shepherd with a lamb, baby Jesus in the manger, and the wise men. Four extra flaps recap the story on the final pages. of the Christmas carol, 'Silent Night', beautifully illustrated by Hungarian-born Krisztina Kallai Nagy. Mary Magdalene has a friend called Jesus. Everywhere Jesus goes, special things happen. There are picnics by the lake, and stories on the mountainside. Children come running, pit-pat, pit-pat, through the streets and out of the town to be blessed by Jesus. But one day soldiers march him away to die on a cross. This is the perfect introduction for children to the events of the first Easter. I wish I had this book when my children and grandchildren were young! One of the very best I have seen for this age group. Repeated phrases such as pit-pat, pit-pat, or left-right, left-right, make this book a joy to read to a little one, and they will soon be joining in. The story starts with Jesus preaching and teaching and meeting with the little children, then moves on to the crucifixion which is not glossed over but handled gently and sensitively before bursting into the joy of Easter and the resurrection. Aided by the illustrations, this is an excellent re-telling and highly recommended. a few noisy visitors arrive . . . Lift the flaps and discover the special visitor who gives him the biggest surprise of all! The story tells the tale of the Innkeeper at Bethlehem who keeps trying to retire, but is constantly disturbed by visitors, both animal and human, wanting a bed for the night in his stable. Once it had been read to her, Hope, aged five, enjoyed turning the pages and lifting the flaps herself, putting her own words in. The indestructible easy-wipe board format is a plus point, making this book great value. 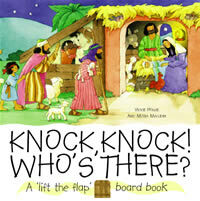 For the youngest family members there is a 'lift-the-flap' board book which gathers together (with appropriate noises) a variety of animals in the stable at Bethlehem ready to welcome Mary and Joseph and then baby Jesus (with his own noise to contribute). Its humour and gentleness will be enjoyed by reader and listener alike. Who's behind the innkeeper's door, the basket of oranges, the pile of logs? Who's making that sound in the manger? Small children will love discovering – and rediscovering – the wonders of the Christmas story in this colourful board book. when they hear a very loud noise outside. Hello! Two kind men have come to fetch the little donkey. 'Someone special needs him,' they explain. Open all the doors to the Easter story and discover the special surprise that Mary finds on Easter morning. 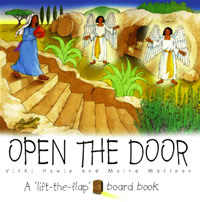 The very smallest book-users are led to the Easter story by a 'lift-the-flap' board book from brf's barnabas imprint, Open the Door, by Vicki Howie, with illustrations by Moira Maclean. The clearly-expressed story brings the beautifully- executed illustrations to life, with lots of authentic detail to talk about before proceeding to the next page with its hidden surprise. As Short-tail and Long-tail build a nest beside an empty cave near Jerusalem, they watch the events of the Easter story unfold – from Jesus's entry into the city on a donkey through to his resurrection. 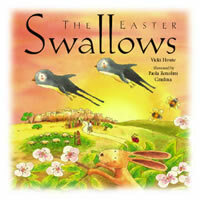 A gentle introduction to the Easter story for young children. 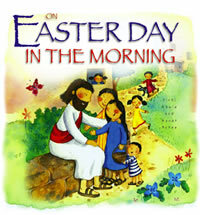 Here is a perfect story to read younger children about Holy Week. As seen through the eyes of two swallows, the story touches on all aspects of the week including some previous miracles performed by Jesus. The illustrations add to the story with beautiful accents. 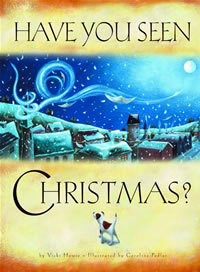 This is a wonderful picture book, telling the story of a homeless lad and his lost rescue dog, who is called Christmas. Although it is aimed at young children, Isabella (eight) and even Alice (ten) were intrigued to know the plight of poor Christmas, who goes missing on Christmas Eve. Christmas is not found in the shiny shopping centre or at the gleaming ice-rink, but in the church hall on Christmas Eve where the local homeless have gathered for warmth, food and drink. The nativity scene laid out in the church hall provides the connection with the birth of Jesus, portraying Mary and Joseph as homeless people taking shelter in the stable generously provided by the innkeeper. 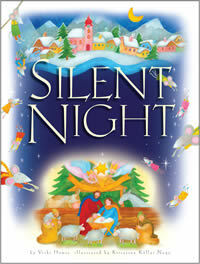 The story ends when the children offer shelter and friendship to the boy, as the search for Christmas is now complete. Gorgeously illustrated, this story underlines the beauty of altruism and encourages children not to be governed by prejudices, as well as highlighting the story of the birth of Jesus. The eloquent descriptions paint striking scenery to inspire young readers' vivid imaginations.